She resurrects long-forgotten masterpieces, providing lectures to the audience, as to why women painters from past centuries are important, and how they differ from their male counterparts. It is obvious from the start, that Heidi is talking about herself. Monteith effectively conveys that Clinton’s generation got lost in the shuffle. 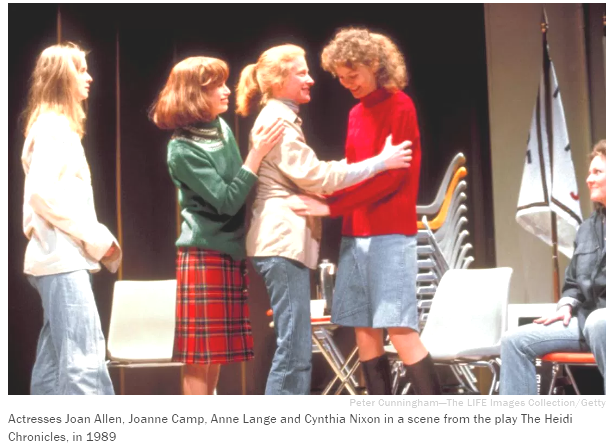 In its intellectual abstractions, the play’s scenes often feel more like textbook chapters from Heidi’s life, than her authentic, emotional experience. She is alienated from her environment, and in her attempts to keep up in a male-dominated society, perhaps she has lost touch with her emotional centre. The characters become caricatures, however expertly played—notably by Jordan Pettle, as charming journalist, Scoop Rosenbaum, Laura Condlin as lesbian, Fran, and Damien Atkins, as pediatrician, Peter Patrone. Some scenes seem like lessons in Feminism 101—albeit failed feminism. The male, as well as the female characters, are self-absorbed, and not all that likeable. In spite of the script’s flaws, the production is well worth seeing. The actors put in a stellar performance—lively, spirited, up beat, witty and entertaining. At its best, there were touching moments that transcend the flightiness of the script—when Peter admits his gay lover may be dying of AIDS and Heidi realizes her attempts at women’s liberation have failed and left her miserable. The characters don’t demand a great deal of empathy, but they are never boring. Director, Gregory Prest, keeps things moving—animated, humorous and colourful. As Heidi states, near the end of the play, the hope for female emancipation may lie with the next generation. Wasserstein’s portrait of American women in Clinton’s era may be authentic, but it is nevertheless, a little depressing. The Heidi Chronicles is playing at the Young Center for the Performing Arts until June 18th.